Editors note: Alexis Blendel submitted this review at the end of May, 2018. AICL is pleased to have her essay on She Sang Promise: The Story of Betty Mae Jumper, Seminole Tribal Leader featured here. Alexis Blendel is one of the Seminole and Miccosukee teens who tweet from @OfGlades. This is my last year of Florida Virtual School. Soon I will take a trip with my cousin to the Glades to visit the Big Cypress Reservation. My mother is originally from Hollywood, but I want to see the Glades again. It is a sacred place for Seminole people. It is an ecosystem where both alligators and crocodiles live. During many wars, the Everglades hid us from our enemies who were too scared to go there. The history of my people in Florida is more complicated than I was taught by white teachers in school. They still have the conqueror’s hive mind. They are obsessed by the purity of what they call the original tribes of Florida. That’s a misunderstanding and a way to criticize our land rights and income. We are descendants of the Creek people. We lived for thousands of years as hundreds of tribes with the same linguistic family—Maskókî. Our families were free blacks and fugitive slaves. We are survivors of Spanish Missions. It is only the name Seminole that came later. When I think about our history, I think about Betty Mae Jumper. Have you read this beautiful book about her? 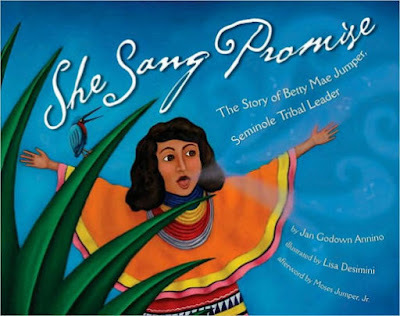 She Sang Promise: The Story of Betty Mae Jumper, Seminole Tribal Leader, is by Jan Godown Annino; illustrations by Lisa Desimini. It is a book for young children. Like many Seminole stories, it is interesting and enjoyable for all ages. The book is written like poetry. It is a creative telling of Betty Mae’s life. It starts in the Glades. In words and colorful images it shows what that kind of life was like. An itchy black bear takes a palm tree scratch, leaving soft fur tufts that swamp mice fetch. Seminole women trailing patchwork skirts reach across chickee floors. This is a place of belonging and peace. Betty Mae Tiger is from there. I don’t like the word WILD. I’m not sure I like the word HEART either. There have always been wild plants and animals in the Glades and it is the heart of Florida Seminole country. But those words remind me of books by white writers, like Heart of Darkness, by Joseph Conrad. I think She Sang Promise is a good book, but it also shows that a white writer will make some choices that a Seminole writer would not choose. This book repeats a story I have heard from other sources. Betty Mae’s mother is from the powerful Snake Clan. As a matter of fact, Betty Mae will become the last living matriarch of the Snake Clan. Betty Mae’s father is a French trapper. Elders believe that Betty Mae’s French father and her family’s Christianity gave her bad spirits: How-la-wa-gus. Some elders come to grab five year old Betty Mae away from her home in Indiantown, to throw her bad spirits in the swamp! Her uncle chases them away and her family packs up and takes her to live safely at the Dania Reservation in Fort Lauderdale. Betty Mae told that story all her life. I wonder if the people in Indiantown were afraid--not of bad spirits--but of her white father having some control over them and coming into their community. When Betty Mae was born in 1923, white men had already done every terrible thing they could think of to Seminole people. Maybe that was the real How-la-wa-gus. No one that I know can say for sure. My father is white and I don’t know him. Not because my mother’s family chased him away, but because he is not interested. I’m glad this book never uses the hate word ‘half-breed.’ I have been called that. I’m sure Betty Mae was called that many times. Some people think it’s a normal word to use. She Sang Promise includes Seminole lessons about Little Turtle and the Wolf and Grey Bear. It talks about the food we ate, the medicine we used and the clothes we wore in the days when Betty Mae was young. The traditional patchwork long skirt is something white Floridians think of when they think of Seminole women. I wear this dress on certain occasions. I do not do it to entertain white people. I don’t live someplace where I can wear it naturally, every day. If I wore it every day, tourists would think I was doing it for them. I love seeing pictures of Betty Mae. She always dressed in Seminole style, as shown on the cover. The vibrant colors of the cover are reflected in the illustrations, which accurately show Seminole culture, throughout the book. Betty Mae saw people reading and she wanted to learn to read. The problem was that she wasn’t allowed to go to white schools in Florida and she wasn’t allowed to go to black schools either! White men made these decisions then, and they still do. You can see that in Florida schools today. people she loves on the land she loves. She becomes a nurse in Seminole country, like her mother, who was a Medicine Woman. These pages in the book are beautiful! Betty marries Moses Jumper of the Panther clan. He is a star alligator wrestler. One day when he is sick, Betty Mae gets in the ring to wrestle alligators. Desimini's illustration of that will inspire children and make them laugh. Some animal rights people will not like it because they don’t understand Seminole culture. Betty Mae travels throughout the Everglades. She helps start Seminole Indian News in 1961. She is a voice for her people. I feel such pride, reading about Betty Mae! Especially because, in 1967, Betty Mae is elected as the first woman Tribal Chairman! I’m glad that Annino calls her a Tribal Chairman instead of the Chief. She Sang Promise was published the year I turned ten and I grew up with it. My mother read it to me many times. I think it was important for me to see this book. Reading it now as a young woman, I see some things in it that I would want to change. I don’t like that it includes the Seminole name Betty Mae’s grandmother gave to her. I won’t write it here. In her lifetime, white people always asked Betty Mae, “What is your Indian name?” I think it’s none of their business. I would still share the book with Seminole children. Betty Mae’s son, Moses Jumper, Jr. wrote the afterward. That means he respects the book. It’s important for Florida Seminole children to have role models and for everyone to realize that Seminoles are not just a college football team! Sho na' bish for reading my review! PS: If your children like this book, they will really like the book Betty Mae Tiger Jumper wrote. It is called Legends of the Seminoles.